Marble flooring tiles can be used in any area of the home, but are especially popular in the kitchen, bathroom, laundry room and even as decorative accents for walls and showers. There are two common choices for your marble tile flooring: traditional and tumbled. Traditional marble flooring tiles have a polished, shiny finish that adds class to your design. They look impressive on an entryway or foyer. Tumbled marble flooring comes in beige and milky tones. They are buffed to have an earthy and natural-looking finish. They come in larger sizes and work well in large areas, such as kitchen/dining room combinations. Follow these simple guidelines to properly install marble tile. Test the floorboards to make sure they are sturdy. If they are not, the grout between the tiles could crack. Check the slope on the floor. A level floor is a must for installing a marble floor. Reinforce the floor if needed. You can reinforce your floorboards with another layer of plywood or a cement backer board panel. Find the center of the room. Check the layout of the marble tile to avoid having a tiny edge on one end of your floor. If needed, move the line away from the center to have equal spaces on both sides. To keep a symmetrical look, have the starting tile straddle the centerline. Apply mortar, preferably a thin-set mortar. Place your marble tile on the mortar. Using this starting point spread the mortar and use a trowel to notch it. If you are applying mortar over seams in the floorboard, apply mesh tape to the seams to avoid cracking. After putting each marble tile on the mortar, place a 1/16-inch tile spacer between it and the next tile. This will ensure that the finished project has an evenly spaced appearance. When the mortar is dry, seal the marble. The marble tile should be sealed using a neutral pH breathable sealer after installation. The sealer will need to be reapplied periodically, recommended every 12 months or so. Marble Tile Topical Sealers: Topical sealers of urethane or acrylic are applied to the top of a natural stone marble tile surface, acting more as enhancers. They provide some level of protection but wear out quickly, especially if applied to high traffic floor tile or busy kitchen countertops. Resealing will need to be done frequently. The resulting finish has a polished appearance that will change the look of the natural marble and make the surface slippery when wet. Marble Tile Penetrating Sealers: These sealers actually seep into the stone and are effective in repelling liquids and oils. This sealer will not affect the look of the stone upon application. The application of a penetrating sealer may require the use of a special cleaner to avoid damaging its protective properties. Though this type of sealer will last longer than the topical form, they also need to be reapplied based on the manufacturer's recommendations, usually every six months to a year. 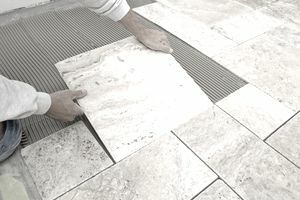 Marble Tile Impregnating Sealers: This is the best choice for superior protection. This natural stone sealer will bond to the marble stone slab or marble tile at a molecular level. It will not affect the surface color and will repel oils and waters from inside the stone. Italy produces a choice variety of colored marbles. Pavonazzo and Dove are both quarried in the neighborhood of Carrara. Some of the finest brecciated marbles are secured from the quarries of Piedmont, and the marbles of Sienna, Verona, and Brescia are well known and extensively used. Many of the green marbles used are obtained from the Provinces of Tuscany and Curia, and some fine brecciated varieties have recently come on the market from the Calabrian district of Southern Italy, shipments being made from Messina. Extensive deposits of onyx are also available, mainly from the neighborhood of Tivoli, and Italian alabaster, raised and worked in the neighborhood of Volterra, is known all over the world.